When I say “best books of 2010” I mean the best books I read in 2010. Some were written this year, others long ago. Read on to learn more…. Last week, I reached my reading goal for 2010. The main reason I’m passing the list along to you is because people so often ask me to suggest books to read. Please be aware that the ones I recommend reflect my own quirky tastes — this doesn’t mean you will like them! But you might. The ones that don’t make the “recommended” category aren’t necessarily bad (although a very small handful are stinkers). Many are by authors who’ve written other books I loved. The near misses are ones that didn’t have the oomph for me to consider them truly great. 1) Knighton, Ryan. Cockeyed. Easily the best book I read all year. 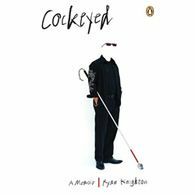 This memoir, about the author losing his vision at age 18, could have been maudlin or overly earnest. Instead it’s thoughtful, edgy and hysterically funny. Quite a hat trick! 2) Taubes, Gary. Good Calories; Bad Calories. This densely written book (filled with footnotes) might not be for you but, as Taube’s subtitle promises, he challenges the conventional wisdom on diet, weight control and disease. You need to be fascinated by nutrition to get through it, though. 3) Jokinen, Tom. Curtains: Adventures of an undertaker-in-training. Comical, reflective, well-written book by a journalist who quits his day job to become an undertaker. 5) Gilbert, Elizabeth. Committed. Unlike many others, I preferred this title to her popular Eat, Pray, Love. This one is more serious and has some interesting reflections on marriage. Not quite so relentlessly ME-ish, either! 6) Murakami, Haruki. What I Talk About When I Talk About Running. Clearly written meditation on running. Murakami has a very spare, interesting style. 8 ) Newport, Cal. How to be a High School Superstar. I’m a big fan of Newport’s blog and here he presents more outside-of-the-box ideas on education. 9) Hillenbrand, Laura. Seabiscuit: An American Legend. Overwritten but still amazingly gripping. I don’t care a whit about horseracing but I couldn’t put this book down. 10) Levitt, Steven & Dubner, Stephen. Freakonomics. Enjoyed this well-written and cheerfully contrarian look at questions raised by economics. 11) Bissonnette, Zac. Debt-Free U. 12) Bourdain, Anthony. Medium Raw: A bloody valentine to the world of food and the people who cook. 13) Feiffer, Jules. Backing Into Forward. 14) Griffin, Kathy. Official Book Club Selection. 15) Krakauer, Jon. Under the Banner of Heaven: A Story of Violent Faith. 16) Moore, Wes. The Other Wes Moore. 17) Powell, Julie. Cleaving: A Story of Marriage, Meat and Obsession. 19) Wiseman, Richard. 59 Seconds. 20) Collins, Suzanne. The Hunger Games. 21) Collins, Suzanne. Catching Fire. 23) Green, John & Levithan, David. Will Grayson/Will Grayson. 23) Cleave, Chris. Little Bee. The compelling story of a 16-year-old Nigerian orphan (who calls herself Little Bee) and a British couple taking a holiday. Superbly told in two voices. My favourite novel of the year, with a deftly handled ending to boot. 25) Stout, Elizabeth. Olive Kitteridge. I adored these 13 linked short stories about a junior high-school teacher, her family and her community. The author is as skillful and gracious as Alice Munro. 26) Bennett, Alan. The Uncommon Reader. This delightfully satirical novella sends Queen Elizabeth II into a mobile library van and reveals the power of literature. Wickedly witty! 27) Rachman, Tom. The Imperfectionists. Set at a fictional English-language newspaper based in Rome, this skillful first-novel focuses on a different character in each chapter. Some are more successful than others (a few are a little too O. Henry-ish for my taste) but overall it’s magnificently pulled off. 28) Brooks, Geraldine. Year of Wonders. A brutally depressing story about the Plague in the 17th century and a village that isolates itself as a result. Superb writing balances the harsh theme. This author’s talent amazes me. 29) Brooks, Geraldine. People of the Book. A fictionalized account of the Jewish religious volume, the Sarajevo Haggadah. Amazing research; riveting plot. I couldn’t put it down. 30) Lambert, Shaena. Radiance. An historical novel set in 1950s U.S., telling the story of a Hiroshima Maiden — a woman disfigured by The Bomb, and brought to the West for surgery. Superb writing. 31) Pullinger, Kate. Mistress of Nothing. Fascinating fictionalized account of a ladies maid in 1860 Egypt. Will be released in the U.S. in 2011. 32) Cohen, Trish. Town House. Didn’t start promisingly, but actually a very funny and charming book about a rock music heir. Could predict the ending a mile away, but enjoyed the ride, regardless. 33) Benioff, David. City of Thieves. 36) Follett, Ken. The Pillars of the Earth. 37) Goodman, Allegra. The Cookbook Collector. 38) Gregory, Philippa. The Red Queen. 40) Hill, Lawrence. Some Great Thing. 42) King, Stephen. The Shining. 43) Lansens, Lori. The Wife’s Tale. 44) Larsson, Stieg. The Girl with the Dragon Tattoo. 45) Lukes, Pearl. Burning Ground. 47) MacIntyre, Linden. The Bishop’s Man. 48) Michaels, Anne. The Winter Vault. 49) Murakami, Haruki. Norwegian Wood. 50) Shaffer, Mary Ann. The Guernsey Literary and Potato Peel Pie Society. 51) Verghese, Abraham. Cutting for Stone. 52) Wesley, Mary. Harnessing Peacocks.